in the kitchen: spicy chicken shakshuka + maple glazed breakfast sausages. this one-skillet dish with poached eggs accompanied with breakfast sausages and a few sides is all you need for a quick, easy and hearty brunch at home with friends, family or loved ones. I hate to say it but winter is here to stay and for me that means all things comforting! If you’ve been following me on social recently, you would’ve noticed that I love cooking and entertaining at home just as much as I love going out to explore the city’s food scene with friends and loved ones. Now that the temperatures are continuing to drop (sadly), I’ve been wearing my apron over my winter jacket more often and I’m not complaining! When it comes to picking out meat, I’ve always believed that simple ingredients make the best products and Lilydale is just that. For over 75 years, they have been providing Canadians with wholesome and delicious products that use only 100% Canadian raised chicken and turkey. They originally began their journey in Alberta and being a fellow Calgarian, I grew up eating Lilydale chicken and turkey products for years as it was a staple in our grocery stores. 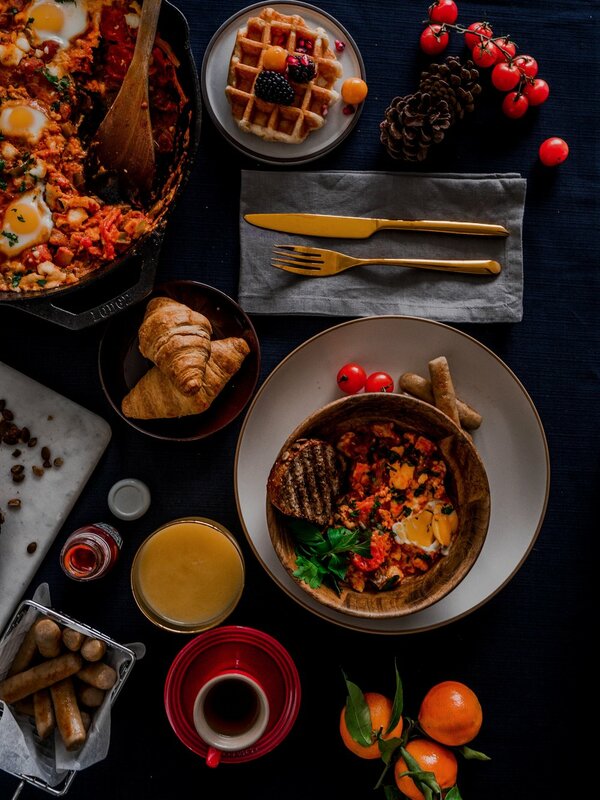 This year, they’re celebrating their 75th birthday and in honour of their delicious products that has satisfied both my family and I, I’ve put together a quick and easy brunch spread that’s sure to make you look like a superstar in front of your guests. I’m a huge fan of one-pot dishes because not only are they simple and satisfying, but they allow you to build up all the flavour in one pot. My favourite all-time one-pot dishes to make, especially for brunch is shakshuka. For those unfamiliar with what a shakshuka is, it’s an Israeli dish of eggs poached in a sauce of tomatoes, spices and more. There are many variations to a classic shakshuka. My twist? A splash of heavy cream to marry the acidity of the tomatoes with the richness of the eggs, Lilydale’s Oven Roasted Carved Chicken and a generous amount of crumbled feta and parsley on top. To accompany my shakshuka, I decided to put together a good variety of sides including Lilydale’s Chicken Breakfast Sausages glazed in maple syrup, a loaf of bread from the local bakery (this is must have if you’re serving shakshuka to soak up all sauce), fresh fruits, belgian waffles (a little sweetness to balance the spiciness of the shakshuka), orange juice and of course a pot of coffee because a morning is incomplete without coffee - don’t you agree? Now, grab your apron and let’s get cooking. In a large cast-iron skillet (preferred) , heat the oil over medium heat. Add the onions, garlic and bell pepper and cook, uncovered, for about 8 minutes, until softened. Do not brown; reduce the heat if necessary. Add the smoked paprika, cumin, coriander, salt, jalepeño and canned tomatoes. Cook, uncovered, stirring occasionally, for about 10 minutes, or until the sauce is slightly thickened. Once thickened, add heavy cream to the sauce along with Lilydale’s Oven Roasted Carved Chicken (diced) , and continue cooking, uncovered, stirring occasionally. Reduce heat to low and turn broiler on in the oven. Turn off (or remove the pan from) the heat. Using a spoon, make 5-6 wells/indentations in the sauce. Carefully crack an egg into each well, then spoon a bit of the sauce over each of the egg whites, being careful not to disturb the yolks. Sprinkle the eggs with salt, then sprinkle the feta around the eggs. Set the pan on the stove over low heat and cover with a lid. Cook for 5-7 minutes, until the egg whites are mostly set but still translucent on top (check frequently towards the end as cook time can vary). Remove the lid, transfer the pan to the oven, and broil until the eggs are cooked to your liking, 1 minute or less for runny yolks (my favourite). Remove the pan from the oven and sprinkle the cilantro over top. Serve hot. In a large skillet, brown sausage links as directed on package. In a small bowl, combine the syrup, and brown sugar; pour over sausages. Bring to a boil. Reduce heat; simmer, uncovered, until sausages are glazed. DISCLAIMER: THIS POST IS IN COLLABORATION WITH LILYDALE CANADA. HOWEVER ALL THOUGHTS AND OPINIONS EXPRESSED ARE MY OWN.